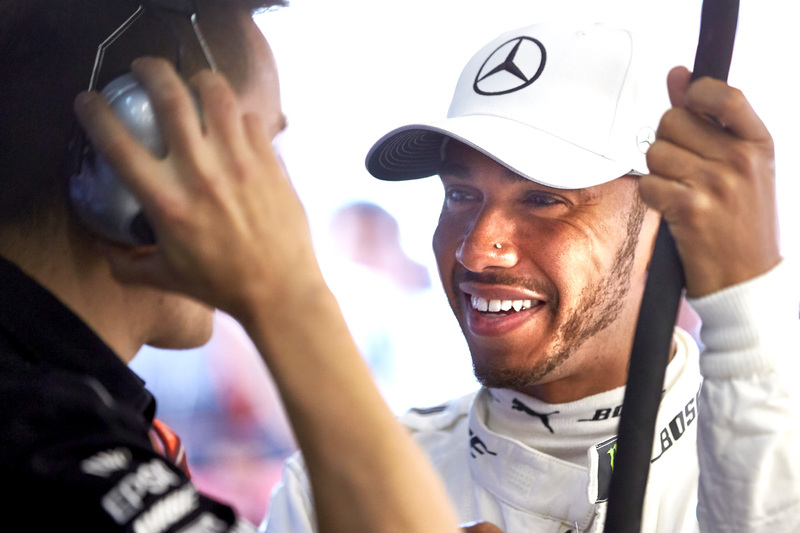 Lewis Hamilton has mastered a treacherous Monza circuit to claim his record-breaking 69th career pole position ahead of the Italian Grand Prix. Crowd favourite Ferrari, however, mustered just seventh and eighth at the team’s home grand prix on a title-critical weekend. Qualifying lasted for more than three and a half hours as rain drenched the circuit, making conditions too poor for the cars to attempt to qualify. A two-and-a-half-hour red-flag period during Q1 covered the worst of weather, but the rain waxed and waned thereafter, making conditions extremely difficult to judge for the drivers, who were perpetually on the fence between intermediate and wet tyres. The rain intensified for Q3, necessitating use of the blue-striped wet tyre, and the longer the session lasted, the more grip the drivers found — until Hamilton hooked up his ultimate lap that proved untouchable. His time — a 1 minute 34.660 seconds — was 1.148 seconds faster than anyone else, earning him his new record. Max Verstappen outqualified Daniel Ricciardo by a tenth of a second in second and third, but neither car will start there after both take significant engine-change penalties that will demote them to the back of the field. Their demotions promote Lance Stroll, who set the fourth-fastest time, to second on the grid, making the Canadian the youngest front-row starter in Formula One history. Esteban Ocon will start from third after qualifying fifth, 0.1 seconds ahead of Valtteri Bottas in the second Mercedes. But the most notable result was recorded by Ferrari, which swung from favourite in the mixed conditions earlier in qualifying to bombing out in seventh and eighth — which will become fifth and sixth after Red Bull Racing’s penalties — by the end of the afternoon. “I’m surprised, let’s say, by how quickly the others went,” Vettel, who qualified behind Kimi Raikkonen, told Sky Sports. The German, who leads the drivers championship by just seven points, maintained he was optimistic for the race, however. The drivers were divided in deciding between the intermediate and the wet tyre after Q1 suggested the intermediate rubber wasn’t providing enough grip on the cold and damp circuit. Daniel Ricciardo Max Verstappen, Sergio Perez, Esteban Ocon, Daniil Kvyat, Nico Hülkenberg and Carlos Sainz started on the wet compound, which early in the session appeared to be the correct choice; however, after five minutes of circulation the green-marked intermediate compound began to find performance. By this stage the circuit was improving rapidly despite reports of rain threatening to drench the track a second time. The results came down to a series of last-gasp laps after the flag, with the major result being McLaren’s Stoffel Vandoorne setting the ninth-fastest time to bump Sergio Perez’s Force India out of the top-10 shootout. Perez missed out on Q3 by 0.002 seconds but was comfortably ahead of Renault’s Hülkenberg, McLaren’s Fernando Alonso and Toro Rosso’s Daniil Kvyat and Carlos Sainz. Saturday morning practice ran for only 15 of its scheduled 60 minutes due to the weather, and by the time qualifying started two hours later conditions had deteriorated significantly. The session nonetheless started as planned — the rain had reduced in intensity, though it remained consistent so that the standing water could not drain from the surface — but it took just four and a half minutes for the conditions to claim a victim. Romain Grosjean’s Haas aquaplaned on the start-finish straight and careered from the left barrier to the right, coming to rest in the grass. The chief culprit was the resurfacing of parts of the straight, which Pirelli said made it more slippery than the rest of the circuit. The race director immediately threw a red flag to recover the car, but conditions intensified in the meanwhile, causing the suspension to last for more than two and a half hours. With Grosjean out, only four cars risked missing out on Q2 in the mixed conditions, which became fit for intermediate tyres less than 10 minutes into the resumption. With six minutes remaining the entire field filtered through pit lane to switch onto the green-marked tyres, but few drivers found more grip compared to that offered by the wet compound. Haas’s Kevin Magnussen was eliminated in P16 ahead of Renault’s Jolyon Palmer, who mistimed his final run and missed the chequered flag, and Sauber duo Marcus Ericsson and Pascal Wehrlein.